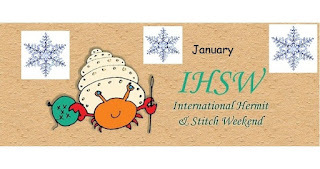 IHSW or International Hermit and Stitch Weekend always starts on the third Friday of the month. It's a chance to lock yourself away and focus on your stitching for the weekend. I am hoping the white daisies will show up on the linen, if not then I'll outline them in yellow. This may have been better stitched on a pale green fabric. We shall see. My current focus for two weeks will be the Discworld Mappe by Lyndisfarne Designs. This is intended as an 18th Birthday present for my son but it may end up being a "Leaving Sixth Form" present or even a 21st if I really get into a slump! I have completed the turtle flipper and started the very large banner being held aloft by two heraldic hippos. I will only have Sunday to stitch as I'm working tomorrow and Monday but hopefully I can complete that shade of Rose Pink in the banner. My goal is to complete the banner this month and start the second hippo. Once I have completed the second hippo I will have stitched the width of the design. Do come back on Monday to see how I got on. If you'd like to be involved then leave a comment on this post or send me an email if you are "no-reply". I'll be putting little reminders up from time to time and will email on 9th February to make sure you send the pic in time. Nice work on Mapps. Hope you get lots of stitching time! Wonderful progress Jo. How is Alice doing? Have you started Queen yet? Nice stitching Jo , you always make me want to pull out a Just Nan chart. Have a fun weekend , hugs . The Just Nan is too cute. I can see the white flower started and it's a dark photo so I think you will be okay. Great work on the Discworld Mappe. Hope you get a lot of progress. I love watching the Discworld mappe grow. Oh I would've thought that the tail flippers would've been the width but the hippo must extend out like them even with the angle! Hope there will be a wide-angle shot! 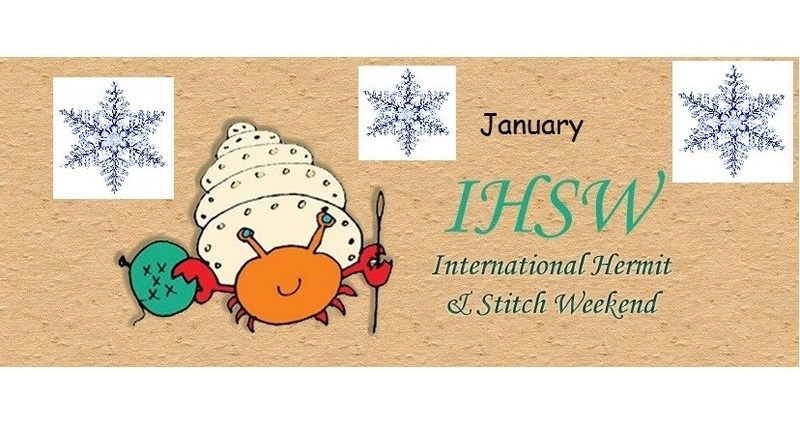 I hope you are enjoying your IHSW, you got off to a great start! You are making good progress on the Mappe design, what a wonderful gift for your son. I love seeing your map again :) Looking forward to seeing how much progress you'll make this year with all the extra focus!